Rajasthan is the magnificent land of numerous kingdoms, majestic forts and palaces, diverse cultures, varied landscapes and vibrant colours. 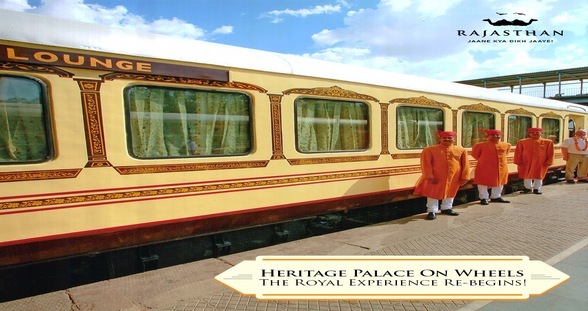 Experience the land of regal splendour with Heritage Palace on Wheels, the contemporary royal living. The Heritage Palace on Wheels is the regal delight where every moment is woven together into an everlasting and immemorial experience to be lived and cherished forever. The makers of the Palace on Wheels have rekindled the charm of luxury with utmost consideration of your comfort and modern amenities at the Heritage Palace on Wheels. This tour is extensively planned to take you through the whispering sands of desert. The intriguing sagas of forts and palaces, and the adventurous escapades to the wilds; while you witness the luxuries on the train in a truly royal fashion. This train is newly built and designed in a contemporary royal style. You will be delighted with the magnificent interiors, sumptuous meals, expensive wines, and personalised service by the Khidmatgars, the likes of which you would rarely experience. The luxurious Heritage Palace on Wheels takes you through a seven day exploration of the vibrant Rajasthan. The magic of the splendid journey begins at New Delhi and prepares you to weave the fabric of delightful imagination becoming reality over the next seven days. Your royal journey begins from Delhi and takes you through various erstwhile princely states of Rajasthan like Jodhpur, Udaipur, Chittor, Swai-madhopur, and Jaipur. After experiencing multifaced Rajasthan you will visit Khajuraho temples unique gift to the world and then Varanasi, The holy city and city of temples and ghats,. In the end The TajMahal at Agra. The entire expedition has been thoroughly planned like The palace on wheels to take you back into the history. Most enjoyable journeys are short lived but long remembered. This journey will come to an end at Delhi. Which will, the onset of your reliving these cherished memories for a life time come get captivated.